Once a year, Frost Amphitheater opens up to the masses for Stanford Concert Network’s annual Frost Music and Arts Festival. The venue is inconspicuously located between Palm Drive and Campus Drive, a sloping stretch of green hidden by a perimeter of trees and fencing. Even when returning for a second visit, the grounds feel entirely foreign, and aside from the red roof of Hoover Tower peeking over the tree line, the university feels miles away. Thanks to the year-round seclusion of the venue and the hordes of students from across the Bay Area who turn out year after year, Frost is an unparalleled escape from the Stanford routine. Gin & The Jitters, a pop-rock student group, kicked things off at around 3 in the afternoon on a perfect spring day. 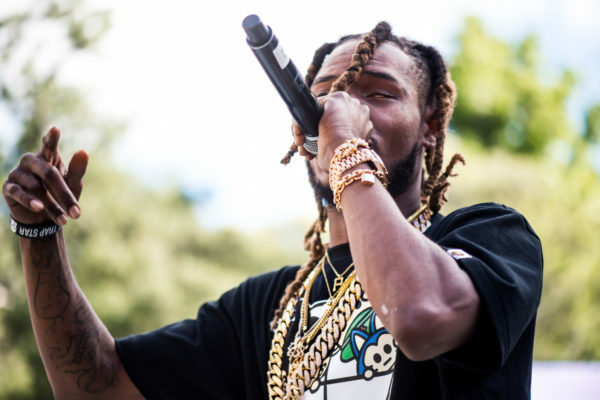 They were followed by Sage The Gemini, the California emcee behind 2013 hits like “Red Nose” and “Gas Pedal.” Each put on hour-long sets as the crowd swelled in anticipation of this year’s headliner, the hit-making singer and rapper Fetty Wap. At around 5 o’clock, Fetty emerged from backstage along with his collaborator and best friend, Monty, another rapper and fellow Paterson, New Jersey native. A few years ago, the two were living out of Monty’s car, working small-time gigs and selling features just to get by. Now they’re mainstays on the top 100 and play festivals and have sold out concerts around the globe. Behind the strength of hits like “Trap Queen,” “My Way” and “679,” they’ve put Paterson on the map. The crowd pressed toward the stage to get as close as possible to the stars, throwing up their phones to snap as many pictures as possible. For his part, Fetty proved that he’s the real deal, putting on a live performance that lived up to his studio work. He and Monty bounced back and forth across the stage, their DJ and hype man working tirelessly behind them. It had the potential to be like a lot of rap shows I’ve seen — lazy half-singing over a studio mix, mics held out to the crowd to sing along, frantic calls for the audience to jump around — but Fetty proved to be a talented showman. The raspy sing-song melodies, booming club beats and explosive boasts that we know and love from his recorded work were all there, amplified by the experience of his surprisingly melodic voice and commanding presence. It’s okay that his music is repetitive, because it’s not meant to be taken seriously: Fetty knows how to have fun, and he doesn’t pretend to offer much more. His work is infectious, joyful and exactly what you want to drunkenly sing along to at a house party or a club. But at an outdoor, daytime music festival? Suffice to say that the setting wasn’t ideal. The truth is that Fetty’s music sounds best when it can shake walls, when its energy can be multiplied by the kinetic frenzy of a tightly packed crowd on a dark dance floor. Frost offers opposite conditions: the blue skies, green grass and ample seating make for a better picnic than a rave. And so even though Fetty delivered an enthusiastic performance, all the energy he put out never really found its way back to the stage. Instead it just dissipated over a lazy late-afternoon crowd and into the spring air, leaving many wondering why the “Trap Queen” they just saw live wasn’t the same as the “Trap Queen” they sang along to a hundred times over many a Friday night on the Row. Basically, if you expected Fetty to singlehandedly turn Frost Amphitheater into one of the house parties you associate his music with, you were probably disappointed. But if all you wanted was to snap a picture, sing along to countless renditions of “1738” and chill out under the sun, it was a great afternoon. Fetty certainly delivered, although the drawbacks of the venue may have made it seem like he was at the wrong address. In the end, Stanford Concert Network put on another remarkably smooth event and created another memorable afternoon of music. Thanks to them, Frost is becoming a campus fixture again, and their hard work shouldn’t go unappreciated. And for their part, Fetty and his openers put on quite a show. It’s just a shame that, for much of the day, the venue just didn’t vibe with the music. Let’s hope that next year that changes, and that the hidden gem that is Frost can be put to the use it deserves. Contact Benjamin Sorensen at bcsoren ‘at’ stanford.edu.